From statues of mermaids and rock stars, to vintage furnishings and artworks from a bygone era, there’s no telling what a shopper will discover at Middle Street Antiques. This wonderfully fun destination that will engage and fascinate treasure hunters of all varieties, (and of all ages), is a gem of a find that perfectly highlights New Bern’s antique shopping scene, as well as its rich local history and coastal atmosphere. Middle Street Antiques features an assortment of vintage treasures as well as imported items from around the world, so shoppers can safely assume that they’ll discover something wholly unique while they are exploring the store. In addition to more unusual finds, the shop is stocked with favorite antique items, such as vintage jewelry pieces, porcelain and bottles, glassware, décor pieces and artworks, and even refined furnishings. With a little something for everyone, and a collection of vintage items that are easily mixed in with stunning and eye-catching pieces that are a bit more modern, there’s plenty of reasons to return to see what new treasures have arrived. 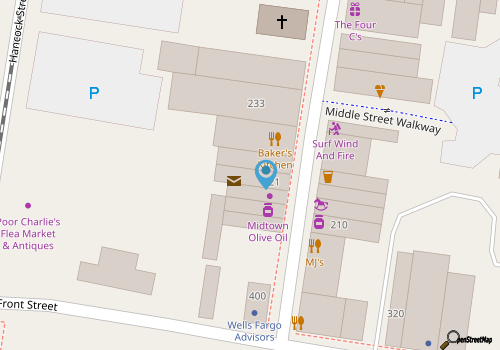 Boasting a central location in the downtown area, Middle Street Antiques is an easy and breezy stop during any walking and shopping tour of New Bern. Call 252-633-4876 for current hours.